New on Phillibustering: Wakefield Baffles Phillies, as Halladay Loses to Red Sox; Mitch Williams’ Autograph War? Two new posts up on my colleague’s blog Phillibustering, a Phillies fan transplanted in Washington D.C.
Tim Wakefield Montage. © Stephen Baron / Skyline Stories. 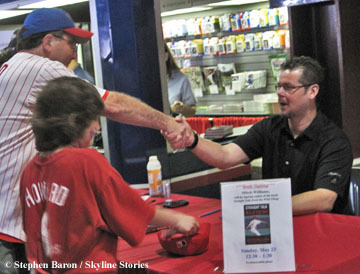 Wrote about the Philadelphia Phillies losing to Boston Red Sox knuckleballer Tim Wakefield on Sunday, and former Phillies closer Mitch “Wild Thing” Williams signing his new book “Straight Talk From Wild Thing” — possibly to start an autograph war with fellow Phillies alum Greg “The Bull” Luzinski. Mitch Williams Book Signing. © Stephen Baron / Skyline Stories. Daisuke Matsuzaka Warms Up Before Major League Ballpark Debut. © Stephen Baron / Skyline Stories. Walking along the concourse at Citizens Bank Park in Philadelphia, Newswire Japan photographer Hideo Yamasaki stood out in the crowd of mostly Irish- and Italian-American baseball fans who came to see the major league ballpark debut of star Japanese pitcher Daisuke Matsuzaka as the Phillies faced the Boston Red Sox. Nearly 40,000 baseball fans and several hundred media members were buzzing with anticipation over Matsuzaka and his fabled gyroball pitch, on the teams’ final spring training exhibition game on Saturday, March 31, 2007. Yamasaki, a photographer for 16 years, was among the 45 Japanese media members at the game, according to MLB.com. The Red Sox spent $103 million this winter to sign Matsuzaka, 26, who pitched eight dominant seasons in Japan and was MVP of the global tournament World Baseball Classic in 2006. His popularity, in part, caused the Phillies to pay the Red Sox $500,000 for their two-game series , the final games of Spring Training, according to the Philadelphia Inquirer. Matsuzaka pitched erratically in his first start and win in a Major League stadium, throwing 82 pitches in four innings in the 7-5 game. He allowed two hits, four walks, three earned runs including one home run and seven strikeouts. Though fans were split on if he threw the gyroball — a revolutionary pitch that comes in like a fastball but turns away at the last moment – Matsuzaka struck out four players looking, an unusually high number. Matsuzaka threw three types of pitches: a 90-91 mph fastball, a 74 mph curveball and an 80 mph changeup. Though the scoreboard could not display “gyroball,” Phillies shortstop Jimmy Rollins said Matsuzaka threw him the pitch, according to the Associated Press recap. Matsuzaka, one of 14 Japanese players in the Majors, finished the spring with a 2-1 record, a low 2.91 ERA and a team-high 26 strikeouts in 21 innings, according to the Boston Herald. The crowd of 39,118 was a laid-back mix of Red Sox and Phillies fans, both clad in red hats, t-shirts and jerseys. “It’s a lot of fun, it’s not as intense because it’s preseason,” said Red Sox fan Dave Bowser, 51, from Easton, PA, who was there with a friend. “But we still enjoy it because it’s baseball.” Phillies ushernice Michael O’Brien, a 31-year-old from Philadelphia, agreed. “If it were a regular season game, both sides would be a little more rammed up,” he said. 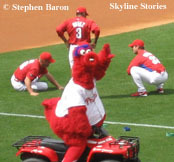 Philadelphia Phillies' Phanatic Mascot in Red for Spring Training Game. © Stephen Baron / Skyline Stories. There were also many Japanese fans. Near Section 112 in the lower deck, there were five Japanese families totaling about 17 people. One girl in a red Ryan Howard jersey (Howard is the Phillies’ slugging first baseman) held up a lime green sign reading in Japanese: “#18 Matsuzaka,” her Mom said, and then a red “Phillies” sign.